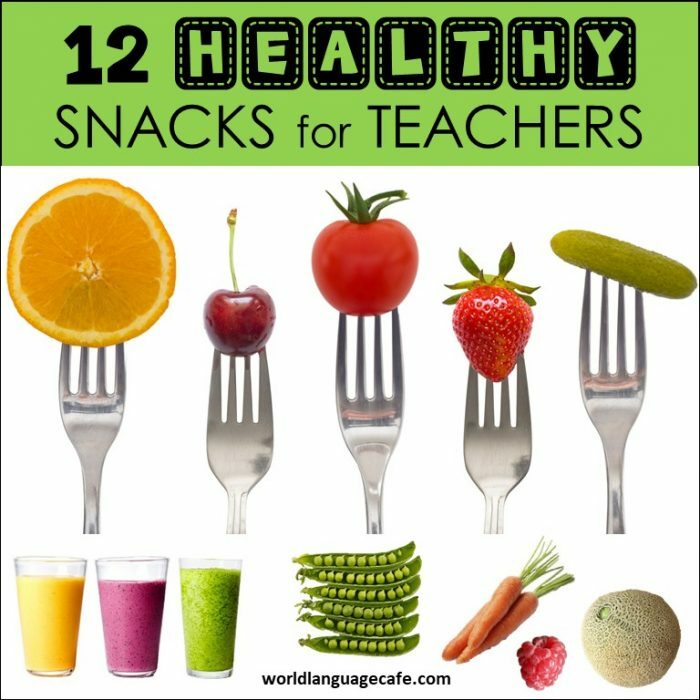 12 Healthy Snacks That Teachers Can Eat on the Run! As teachers, we’re always on the move – running to the bathroom, walking around class to check on partner work, squeezing in a trip to the copy room, etc. It’s important for us to have healthy teacher snacks that we can wolf down in a few minutes to keep up our energy throughout the day. It’s so tempting to reach for chocolate, sweets, or chips, especially when we’ve had a rough day and are tired. While these are fine every once in a while, if they become a habit, you’ll start to crave sweets and junk food and will gradually pack on the pounds throughout the year. Try these 12 healthy, tasty treats that you can eat in between classes. 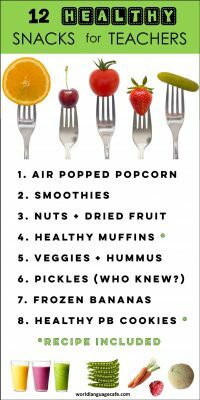 Get an air popper – they’re not very expensive and popcorn is a filling, yet lower calorie snack. Melt a small amount of butter to mix in and add a little bit of salt. Tip: The popcorn that you microwave is NOT HEALTHY and it uses a lot of wasteful packaging. Get a container of kernels at the store – not only healthy and low calorie, but much cheaper. This is my go-to snack when I’m on the run. Delicious and nutritious! Best of all, you can switch up the fruits and veggies in this recipe and they always taste yummy. I included the recipe at the bottom of this post (from “Simply in Season”, which is an AMAZING cookbook – lots of tasty recipes using fruits and veggies based on the season of year). There is also a printable copy in my Free Resource Library. Boil the beans for a few minutes with a little salt in the water. Drain, peel, and eat. Sometimes I find that when I have to work a little bit for my food, it’s that much more satisfying. My personal favorite is carrots and hummus, but other people really like cucumbers, red peppers, broccoli, and cauliflower. Buy a bulk bag of almonds or walnuts and put a few in a container with some dried cherries or dried apricots. Want to work a bit for your snack? Get pistachios! I used to get frustrated with all the ones that I couldn’t open, but I came up with a cool trick. Take a half a pistachio shell, insert it into the small crack of the one that doesn’t open and twist it. Works really well. Did you know that dill pickles are really good for the healthy bacteria in your gut (your biome)? If you’re looking for a salty snack, these are the perfect fit. Just think of all those trillions of microscopic bacteria yelling, “Woo hoo!” when that pickle arrives. Take the money that you would use buying sweets or junk food and splurge a little bit on your favorite fruit. Usually we just get the cheaper fruits (oranges, apples, bananas) and so that just becomes routine in the grocery store, but it’s so much more fun to pick out something that you really love. Think cantaloupe, watermelon, kiwi, mango – mix it up! When I bring my kids to the supermarket, I always let them pick one healthy food that they really want. My son loves raspberries and blackberries. My daughter loves shrimp (usually expensive, but it’s only $2-3 if you get just a 1/4 pound of small shrimp) – cheaper than a bag of cookies. These bars have fruit, nuts, and sometimes a little salt, but no junk, just real food. Healthy and tasty – my favorites are peanut butter and blueberry. A little expensive, but perfect for throwing in your bag as you’re running out the door. Just don’t eat them in your classroom in case you have any kids with nut allergies. Let’s be honest, who doesn’t want a sweet treat after a hard day of teaching? It’s fine to treat yourself, but your body will be much happier if these treats pack in nutrients, too. A banana, a tsp. of cocoa powder, a cup of almond milk, and a little protein shake powder = chocolaty, sweet goodness without any sugar. My favorite shake mix is PlantFusion Complete Plant Protein (Natural Flavor) – you can mix it with anything and it tastes good, plus I love that it’s made from plants and not a whole bunch of artificial stuff that you can’t pronounce. In Costa Rica, I had a delicious smoothie of mango (I get frozen mango chunks and defrost them), cocoa powder, almond milk, tahini, and peanut butter. Scrumptious! Looking for other kinds of smoothies? Type “smoothies” into Pinterest and you’ll find a bazillion tantalizing recipes. Warning: You could get sucked into Pinterest for hours! Ok – so this isn’t perfectly healthy, but it’s better for you than a nighttime bowl of ice cream. Peel bananas, cut them in half, stick them on a popsicle stick or a popsicle mold stick, and freeze them. Melt some chocolate in the microwave and use a knife to coat the banana. It will freeze instantly. Delicious! These are so delicious and easy to make! They’re usually gone within a day or two at my house. Recipe listed below or get a printable version in my Free Resource Library. After you sign up, check your email for the password and access link. Hope all this yummyness gives you the energy you need to make it through the day and stay healthy at school! If you have ideas that I should add to this list, let me know in the comments section. Mix all these together. Then add the next set of ingredients – these are the ones that you can play with. Mix it all together and put into lightly greased muffin pans. Bake for 18-22 minutes (check after 18 – if you added more wet ingredients, they may need to cook longer). Just discovered these awesome silicon pans – so much easier to clean than regular pans. And you can use less oil. Mix the dry ingredients. Add the other ingredients and mix. Bake for 12 to 14 minutes, until the edges just begin to brown.